Home→Family→History→#TBT: Golden Rule Grocer Co.
#TBT: Golden Rule Grocer Co.
I’m researching my family heritage… using different ways to decipher all the information out there besides just using ancestry.com. I’m presenting a Beginner’s Guide to Genealogy class in a couple of weeks, and figured a few examples of thinking outside the box might come in handy! Whooooooeeeee! It doesn’t quite match up with my vaguely remembered story… but, yes, W.C. and Son are advertising in the Hugo Husonian newspaper in 1913 and 1914. I’m still looking on when they bought and sold the place… but a little further research and ta-da! 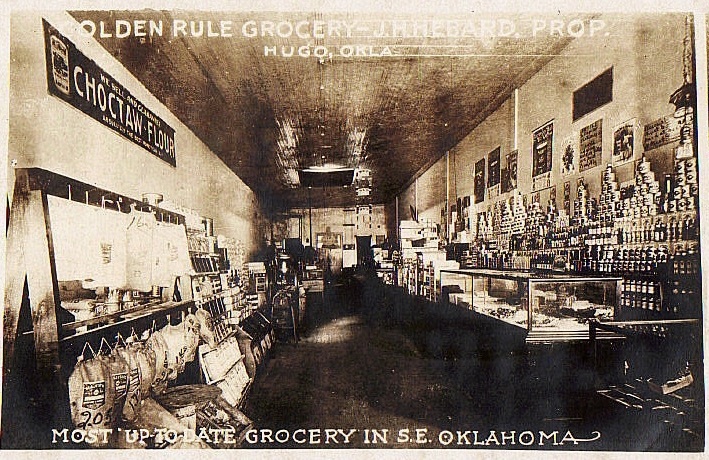 I find a vintage postcard of The Golden Rule Grocery, Hugo, Oklahoma in 1909. Now, I’m not sure yet when they bought that store… or really, much of anything yet, but I imagine the store didn’t change too much when my great grandfather and great uncle(s) ran it a few years later (Note the Choctaw Flour advertisement on the wall!). How the store in Paris, Texas fits in… yeah, I’m working on that too! So I figured this qualified for a #tbt. Here’s a recent photo of the old building in Hugo, Oklahoma. Bob says, with a huge question in his voice, “Scott Winfield Burton.” Ring any bells over any grocery store doors? He knows less than nothing about the man, his grandfather. I will definitely keep my eyes out for the name! Wouldn’t that just be a kick after all???? Dear Carol. I am Sharon Drake from Winfield, Kansas. We live at the Oklahoma/ Kansas border. South of Wichita, Ks. I found that a lot of counties have books on history of the county and the towns history. The people and business, churches, etc. I found out that was written about the county my Mother’s family lived and there was a lot about the family. Usually those books are in the public Library or museums. have fun with the your search. it will never end. Just when you think you have everybody, someone says “Hey , here I am” Thank you for telling about your family and life of a rancher. Interesting! Our new (as of Oct. 2016) grand-daughter inlaw comes from Paris, Texas! Very rewarding research! I love the name of the store. Wonder what you’ll discover as you keep digging into your past? That’s pretty cool. My great aunt and her best friend spent many years working on our family. She published it and I am so thankful I got a copy. I am ashamed to say I haven’t fully kept up with the growing families since her death, though part of the problem was a big family feud. It’s interesting to know your background! Yeah, I’m finding that too… but more and more information is coming online… so I’m just curious about those “lost” relatives!